R E D consists of twenty-seven erasure poems. They were produced using a system of formal constrains: text was erased while preserving the word order of the original source, with no words altered or added, according to a strict set of self-imposed rules. The poems use as a source the novel Dracula by Bram Stoker. As the text of Dracula, a classic Victorian-era horror novel soaked with a disdain of femininity and the misogyny of its time, is erased, a new story is told, in which the narrator takes back the agency stolen from her predecessors. This work was written at the same time its author had begun their own gender transition. As they were discovering and attempting to define their own womanhood, the narrator of these poems traveled alongside them. I’ve been intensely studying poetic appropriation, and erasure in particular, for kind of a long time, and it seriously terrifies me. It scares me how easily it can become violent, and how often people use it in a violent way. It’s a poetic form, certainly, but it’s inherent politicality is both potent and dangerous, in a different way than, say, a sonnet in iambic pentameter. Not to say that any formal device is apolitical, but the way erasing interacts with another person’s work is an especially risky enterprise. Solmaz Sharif wrote a brilliant and important essay on this: required reading for anyone considering using erasure. This Robin Coste Lewis lecture is also incredibly necessary. Berggrun’s language is staggered, direct and intimate, even as they use Stoker’s original words, in his original order. One can’t imagine Stoker writing, as Berggrun reveals in their own “CHAPTER XV,” such lines as: “I was surprised when unconsciously I imagined // the way his sperm dropped in white patches / which congealed as it touched my body [. ]” I’m startled by how rich and how strong this collection is, and how deeply personal and intimate, which allow for such powerful results. And curious how Dracula, again, became the source material instead of any other particular title, although Frankenstein, or, The Modern Prometheus (1823), another book of creation, might miss the point, being a book of creation out of dead parts, instead of a book that simply revealed what had already been there, albeit hidden or repressed. 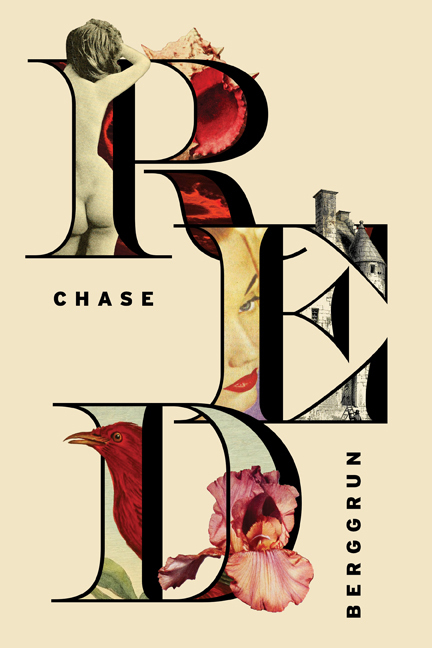 R E D is a book of declaration that forces “I am here,” even as we witness this stunning and revealing metamorphosis.